Welcome to the terrifying world of Halloween! One of the most exciting traditional festivals, Halloween is celebrated with much enthusiasm throughout the world on 31st of October. Halloween is known to be originated as the festival of Celtic New Year of Samhain and is supposed to be reserved, as a day for all the evil like ghosts, vampires as well as witches to visit earth and haunt it's inhabitants. To ward off these evils, people since time immemorial have been wearing Halloween masks and costumes as a Halloween tradition. In addition, people organize many customary activities that include much fun filled traditions like costume parties, Halloween games, visits to people's homes to collect cookies and toffees, a ritual practice known as trick or treating, and much more. The day of Halloween is reputed as the day of unleashing the monster within and They Deserve It brings all the relevant ideas that could help you in doing so! To celebrate the festival of Halloween, people also exchange gifts with their families, friends, neighbors and children, and kids have the most fun out of this festival, since they get the maximum number of treats, delicacies and gifts on this day, not to forget all the fun too. From delicious Halloween eateries to scary knick knacks like jewelery, mugs, and costumes, interesting gift items throng the market during Halloween. Take a look at some popular Halloween gifts. This extremely creepy looking gift basket, with spidery legs, from the Popcorn Factory, contains many Halloween delicacies like, popcorn, honey roasted peanuts,chocolate chip cookies, and mellocreme pumpkins, which together provides the authenticity and the fun of the Halloween. 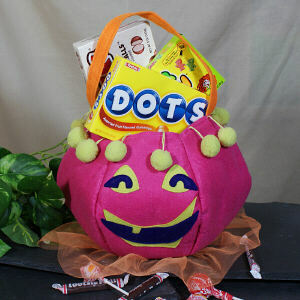 These creative bags for kids provide a fun experience of Trick and Treating. 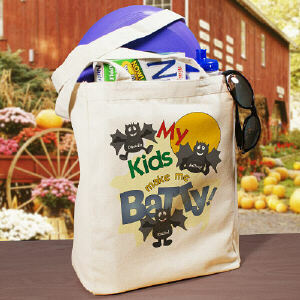 You can get the names of the kids embroidered over them, and present them the bags before their Trick or Treat visit. The carriers have reflectors and lights as well and are available in various shapes like Frankenstein, Dracula, Witch, skull, pumpkin or spider. Get the piece of your choice. The special Halloween mugs in different colors, for instance, Orange for Happy Halloween, Green for Witch's Brew and Red for Hot Shot, can be bought from the market. They have crawling spider images with scary Halloween messages over them. A beautifully created detailed pumpkin, with a Halloween message or simply the name of the recipient of gift, can be gifted to friends and families. It has metal leaves and vine coming out from it, which makes it a beautiful decorative item too. Traditional confectionery items, these caramel apples, are the essence of Halloween. Available in varieties of style, hand dipped into sugar, cinnamon, and chocolate, these apple pies are the best treat during Halloween and make a perfect gift. Ceramic pumpkins designed by Martha Stewart, in a pattern of real pumpkin in black and white with scary images of crows or other spooky creatures, are available in market as Halloween gift items. You can also gift the traditional pumpkin crafted hangings called Jack-o-lantern, with their scary smile. They look wonderful in the garden during night time, and create a very frightening image. Another Halloween gift basket filled with various candies, chocolate, cookies, brownies, jellies, peanuts, nuts and dry fruits, makes a wonderful Halloween gift, especially for the kids who knock your door for trick or treat. You can also gift these baskets in a Halloween party. The real fun of the Halloween is in the interesting costume parties and masks. There are many outfits, frightening, grotesque and theatrical, which you can gift your family and friends for a Halloween, including the famous movie characters like Jack Sparrow, Star Wars heroes, and animated characters like Mickey and Mini. Masks such as the Scream mask, Jason mask, Shrek mask, alien and other monster masks can also be gifted. You can also gift quirky outfits for animals on Halloween's. There are many crockery items , that are specially designed during Halloween, with images of creatures and monsters over it and with scary notes. One such piece is the black colored Witch's Brew Goblet, on which you can also get the name of the person it is being gifted to, printed. Also available in this category are, candy bowls, urns and plates. You would definitely have heard about the scary frozen hand, which oozes blood (artificial) and is grotesque (artificial again), there are gifts available inspired from that, and these are soaps and various eateries, in the shape of body parts, especially fingers, hands and eye balls. The candies available in these forms can be packed along with many other cookies and can be gifted in a package, to create a scary impact of Halloween. You can gift these items on Halloween to your family members, relatives, friends, and neighbours, while at the same time you can also make a similar present for a party, as Halloween delicacies of chocolates, cookies candies; the customized Halloween showpieces like pumpkin decors and table wares, and gift baskets, are the essential items during Halloween festival and appreciated by everyone. So fly into the haunted air of the day and have a spooky Halloween! Last Updated On : October 06, 2011.